I’ve been busy. Yes I can hear the groan of “So what else is new” coming from the back, so stop it, I know I’m a glutton for punishment! 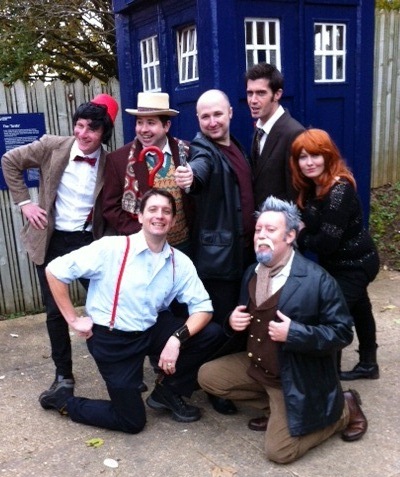 Actually, this weekend I’ve been playing the wonderful Donna Noble in OFSTAGE THEATRE’s Doctor Who parody at the Avoncroft museum Doctor Who day. You can probably tell from the picture with the Ood. I bloody love an Ood, they are immensely cuddlable. Shh, yes that is a word. I wish that could be my job, pretending to be somebody else and making people smile, what a lovely job that would be. Maybe with a slightly less itchy wig, although with the wig comes the accent. It’s like I put on the wig and it injects my poor brain with the hint of a bossy, Chiswick accent. Oi Spaceman! It looks like we’ll get to do the play again at the Cheltenham Brewery on Saturday! Not only is it the switching on of the Christmas lights, but it’s also the day of the 50th anniversary episode! Woo hoo! Anyhoo, I’ve been feeling rather painful lately, but it’s having an odd effect (rather than an ood effect). Because I’ve been doing this NLP (Neuro Liguisting Programming) course I’ve been trying to apply some of the exercises to myself. This has resulted in several days of being in pain, but being HAPPY. *blinks* The idea that pain doesn’t have to be the be all and end all of my day is a really great one. It’s something that needs work I know, I have been pushing myself a little too hard because of it, but I think it’s a great step forward. Did you know that you’re brain doesn’t process a negative? So for example, saying “Don’t drop that tray!” Is going to put the idea of droppage in to the person’s head, but if you say “Keep hold of that tray!” They think about holding it. See? It’s quite taxing on the brain at the moment, but I think once it’s programmed in properly, it’s really going to make a difference. Unfortunately today my brain just cannot stay focused. It keeps slipping away from me, someone removes my ability to see the words on the screen and to grasp the thoughts I’m looking for. You know that feeling you get when you stand up too quickly and you brain offers you the opening sequence to any 1970’s sci fi show? It’s that. If I could go home and close my eyes, that would be amazing. My kingdom for enough cash to have a part time job…..